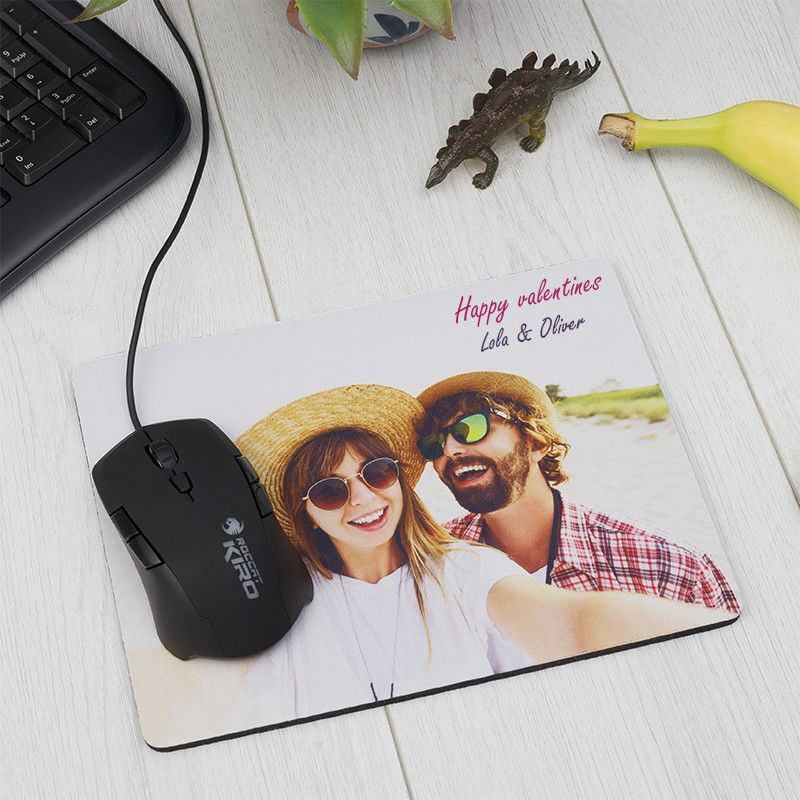 Make your own personalised photo mouse mats with pictures for a personal touch at home and work. This rectangular custom printed photo mousepad with curved corners is ideal for your computer mouse. With our next day delivery, these personalised mouse mats can be with you fast. We know that our fabric topped mouse pads are the best printable ones around, and we are sure you will be happy when you create your own mouse mat. Design your mouse pad online. The result will be worth it. The perfect balance of colour vibrancy and durability, plus the pointer precision reliability, will give a smooth experience while in use. We have been making quality photo gifts for more than 12 years so we're very comfortable with ensuring you get the highest quality product and service. Our mouse mats are thick, strong, tough and long-lasting. Just try our design tools; press 'start design' above and create yours. Trying is free! Excellent quality, easy to order and delivered very quickly. I would definitely recommend and use them again. The mousemat I ordered for my Dad was great quality both in terms of the mat itself and the image reproduction on it. Delivery from point of order was really fast! My Dad was really happy with the college of photos of one of his favourite places. Very easy to use when applying a photo for a mouse mat and very efficient service. The mouse mat is thick and seems high quality. Very pleased. By beloved 18 year old tortie had just passed away and I wanted pictures of her around me. So I ordered the mouse mat. It came really quickly and I'm very happy with it. It's made of thick foam and feels good. The picture of her has been reproduced beautifully. Very happy. Your design is printed using a specialist deep infusion technology. This uses eco-friendly inks and a top of the range digital printing process to bond your photos into the fibres of the fabric. Your mouse mat is cut to size and quality checked before being sent out to you. We make your mouse mat the same day if you order before noon. In our design system, you can add single photos, or make an automatic montage of photos and even add text to your personal mouse mats. So many great events or occasions can be immortalised and tagged with some text to make a neat great value gift. The personalised mouse mats and pads are very popular and versatile photo gifts. Our next day delivery means you could see your custom photo mouse pad very soon. Favourite phrase? Add it to a custom mouse pad. Favourite picture or graphic design? Make it right here. You can customise mouse mats in a huge variety of ways, and it's good fun designing them too. Design your own mouse pad by pressing start design above and uploading a photo. See before you buy, and even preview a photo collage mouse mat. Our montage app is ideal for trying out a photo collage mouse mat idea. Gifting practical presents is a whole lot easier and better when it's personalised, especially in our quality. Customised mouse mats are no exception, and you can design online and buy a high-quality rubber pad that has next day delivery. You can even create bespoke company mouse mats which feature your logo or pictures of your staff.